Wow! 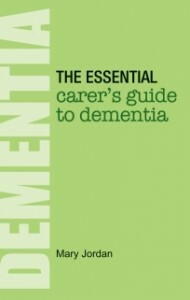 Really excited as advance copies of my latest book The Essential Carer’s Guide to Dementia have just arrived. Love the feel and smell of new books. This one took me nine months to write but into it I have put 10 years of experience – everything I learned whilst looking after my mother-in-law, all the knowledge gained during my years working in the NHS and at Alzheimer’s Society as a Dementia Support Worker, all the extra advice and information I have obtained from helpful colleagues. If you are looking after someone with dementia of any kind this book will be your guide. You can read it straight through or dip in and out at any time for the advice you need. I arranged the format so you can come back to it time and again and always find the information you need. In my work with Alzheimer’s Society I reach out to people with support and advice every day – through this book I hope to help all those who are ‘out of my reach’ in whatever area you live. Independent Living has reviewed the book. You can find the review here. Next post: Finalist for People’s Book Prize 2015!